The only equipment you need for this project is a digital camcorder, audio/video cable, DV tape, and a TV. Remote controls are optional. The audio/video cable in this demonstration is a common style with consumer-based one-chip camcorders. One end has a yellow RCA composite video and red-white stereo audio connection. The other end has a 1/8-inch jack, similar to a headphone jack. On higher-end prosumer/professional three-chip camcorders, the cable is likely to feature a yellow-red-white connection on the camera. Another alternative is to use the red-white stereo cables and S-Video connection. Most newer TVs come with the yellow-red-white connection in front or on the side, as shown here. If you don't see a connection in front or on the side, check the back of the TV for one. If you don't have one, consider purchasing an RF modulator to convert the yellow-red-white signal to RF or coaxial. If you see a connection in the back but have something plugged into it, unplug the current connection and move to step 3. You can disregard the black cable already plugged into the television. That is the S-Video connection and is usually located near the yellow-red-white inputs. You don't pull the cable toward the TV once it's plugged into the camcorder, because it might pull the camcorder off the table or shelf it's resting on and cause damage. Insert the cable into the color-matching slots on the TV labeled Video In and Audio In. If you are using S-Video, disregard the yellow composite cable. Attach the S-Video and red-white stereo cables to your TV. In the photo, notice the 1/8-inch jack being pushed into the slot labeled Audio/Video Out on the camcorder. It's that simple. 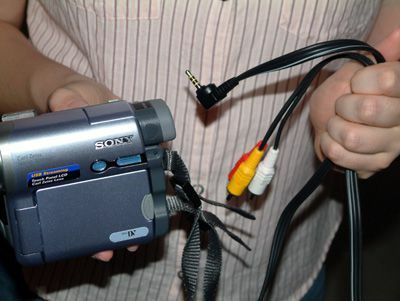 On camcorders with the yellow-red-white or S-Video cable, attach them the same way you did on the TV — only, this time, match the color-coded cables to the connection labeled Audio/Video Out. Easy enough! But don't worry about changing channels just yet. You have a couple more steps. On the panel where you turn your camcorder on to record video, you'll notice another option allowing you to play back what you recorded. On many camcorders, the button is labeled VCR or Playback. If that's not the case with yours, don't panic. Just look for a function similar to a VCR or playback feature. You'll know you have video when you hit Play and a recorded image starts playing in your viewfinder or LCD screen on the camcorder. All TVs with yellow-red-white or S-Video inputs have an auxiliary channel. You should be able to find it by turning the TV to channel 3, and pressing the channel down button on your remote control or TV until you see the video playing from your camcorder. It should only take a couple of presses to find the auxiliary channel. If your TV is auto-programmed to cable or satellite, there's a good chance you won't have the option of pressing the channel down button to find your aux channel because the TV won't have it in its memory. Find your remote control and press the TV/Video button until you see your home movie. The reason you should wait until now to tune into your auxiliary channel is that it simplifies finding the right channel for your home video playback. If you have an image on your camcorder but not on your TV, something's wrong, right? Just to be clear, you will be on the correct channel when you see the video playing from your camcorder on your TV.